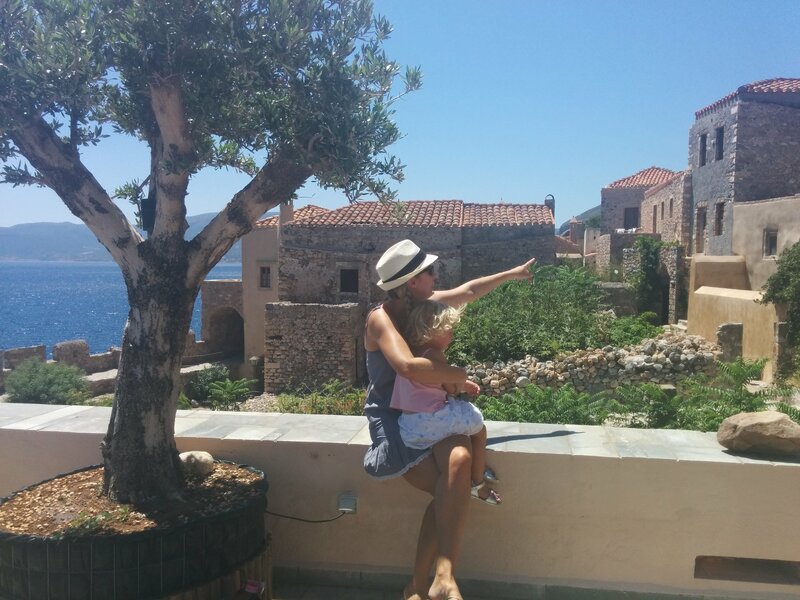 Monemvasia, a steep rock, a ruined fortress, a fortified city with cobblestone alleys, narrow streets, dramatic scenery...One of our most amazing family summer vacations is the one to Monemvasia. This unbelievable destination has won our hearts forever. 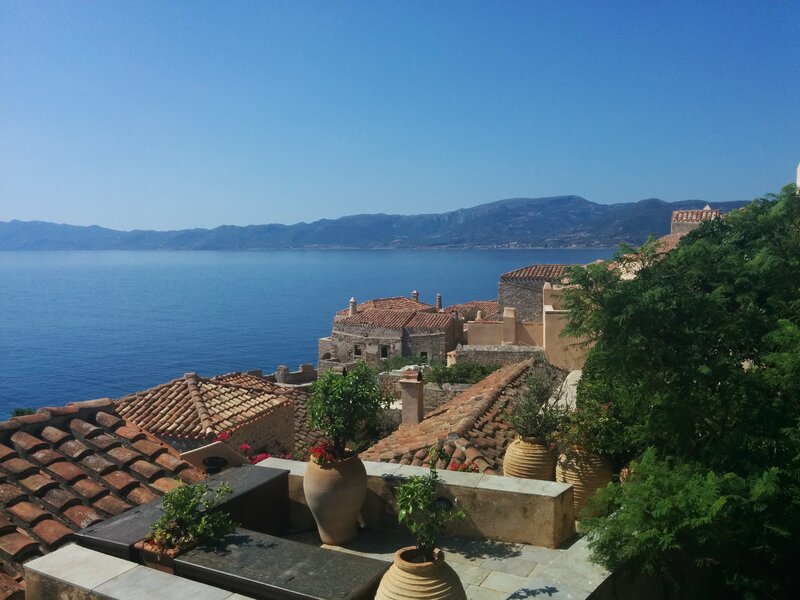 Here is our personal story creating a guide on Monemvasia Stay, Eat and Do. Monemvasia (Moni means ‘single’ and Emvasis means ‘entrance’) is located on a small island at the Southeast coast of the Peloponnese. The island, or better, the Rock (think Gibraltar!) is connected with the mainland by a bridge called Gefyra. 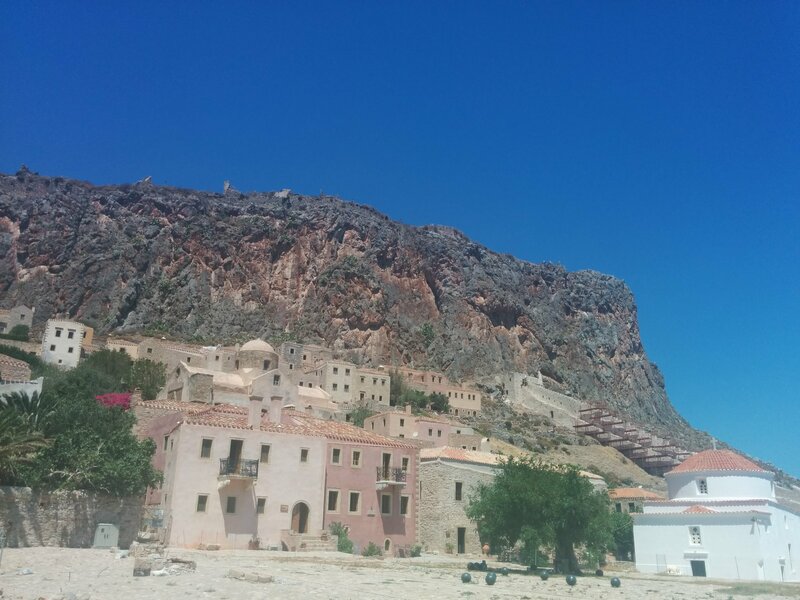 Monemvasia is a medieval castle town, it is also called The Castro by the locals and was founded in AD 582/3. It has been in the hands of the Franks, the Byzantines, the Venetians and Ottomans and their influence is still so present everywhere. 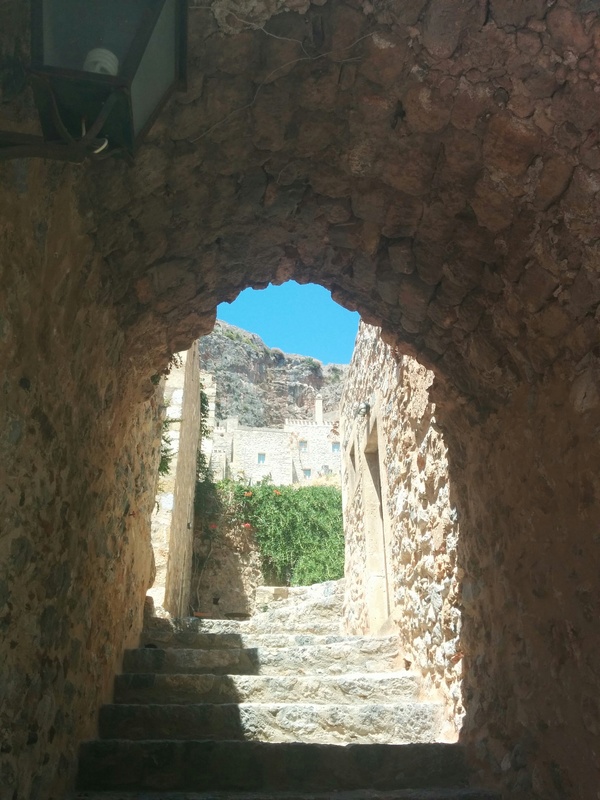 Monemvasia is nowadays an open archaeological site attracting tourists in summer and winter. 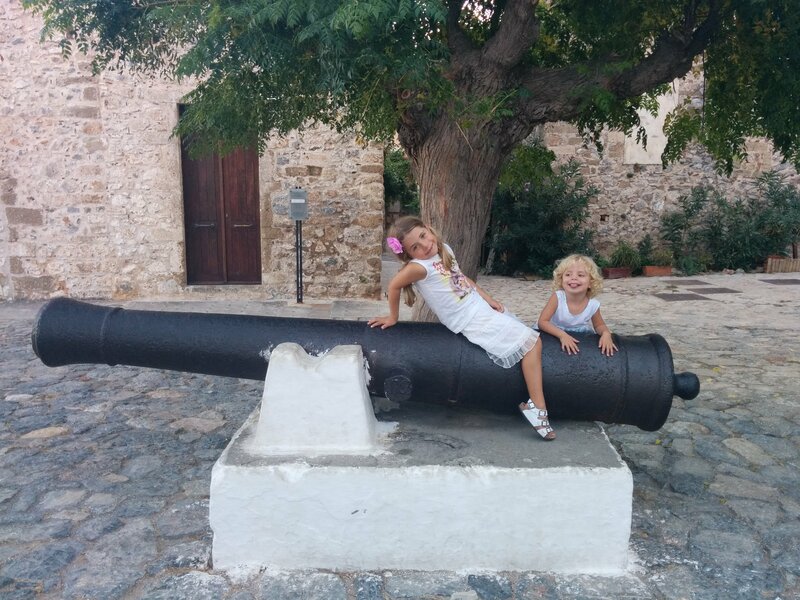 A good friend of mine and local resident invited us to during the summer and showed us the wonders of Monemvasia with kids. The moment that we passed the dark tunnel entering the castle, we felt that we had traveled back in history. Still blinking our eyes from the bright light, we entered the magical old town. We started walking through the narrow main street and saw stone buildings with walled gardens and courtyards, many churches, towers, and ruins. We saw a canon, mysterious alleys, narrow cobbled streets, exotic plants and heart-stopping sea views. We fantasized about knights and kings, pirates and princesses. Our adventure had started. Hotel Byzantino Serving an amazing breakfast in their café. Hotel Likinia Family rooms, connecting rooms and rooms that share their own entrance from outside. Ardamis guesthouse Mr. Vasilis Ardamis recommended the following family rooms in Ardamis: 14, 22, 18 and 19. In one of his suites is an ancient marble well. It’s covered by a glass plate and lit inside and you can see the water meters below! It must be very special to spend the night inside the Castro. But I believe that this is more suitable for families with 5+ children. Or for families with babies that are carried in a baby carrier. Otherwise, stay at the Gefyra or one of the nearby beaches. Remember that you cannot bring a car in the Castro and you will need to drag your luggage (and kids!) through the cobbled lanes when you arrive or have someone to do that for you. Gefyra is the center of a developed tourist area with many hotels and apartments. There are more budget-friendly options than in the Castro and parking in easy. In the square by the sea, there are restaurants and taverns, as well as many tourist services. There are pharmacies and many shops to cover all needs. There is an organized crystal clear pebble beach in the port as well as a cute and safe playground. You can also choose to stay toward the north, at Kakavos beach or Pori beach. To the south, the beaches are near the villages of Agia Paraskevi, Agios Stefanos, and Nomia. My family stayed at Pori and we used our car to go to the Castro. Some days we would park at the designated parking at the Gefyra and use the air-conditioned shuttle bus to go up to the entrance (shuttle bus leaves every half hour from morning until midnight). Other days we tried to find a parking space near the entrance and walked. Due to its archeological status, there are no swimming pools allowed inside the Castro. So if you are staying there and you want to swim, you can dive off the rocks at the ‘Portello’ at the old wall: a stone platform with stairs into the sea. This was too difficult for my 3-year old and so we swam at Pori beach and Ampelakia beach, both a max. 20 min. drive from the Castro. These beaches are not organized so you will definitely need to bring an umbrella. They did have showers and plenty of parking spaces. The Byzantino cafe at the central square serves an amazing breakfast with locally produced and homemade delicacies (10E p.p. from 8:30-10:30, daily in August, other months only the weekends). We also had a drink here in the afternoon whilst my daughters were running around the square. It is located at the busiest part of the town. For breakfast, lunch, dinner or cocktail with amazing views, visit Emvasis. I had a very relaxing time here with great coffee. Recommended by my local friends, we ate lunch and dinner at Matoula taverna on the main street. Very friendly staff and again with a stunning view over the sea. We also ate at Voltes. An amazing place inside mysterious old tunnels decorated with art serving ethnic food with interesting species prepared in a traditional way. The bread was served in a paper bag and the dishes were easily adjusted to my children’s taste. For relaxing cocktails, I recommend the Malvasia Café & Bar. We had drinks, listened to classical music while overlooking the endless blue sea. The kids loved it. 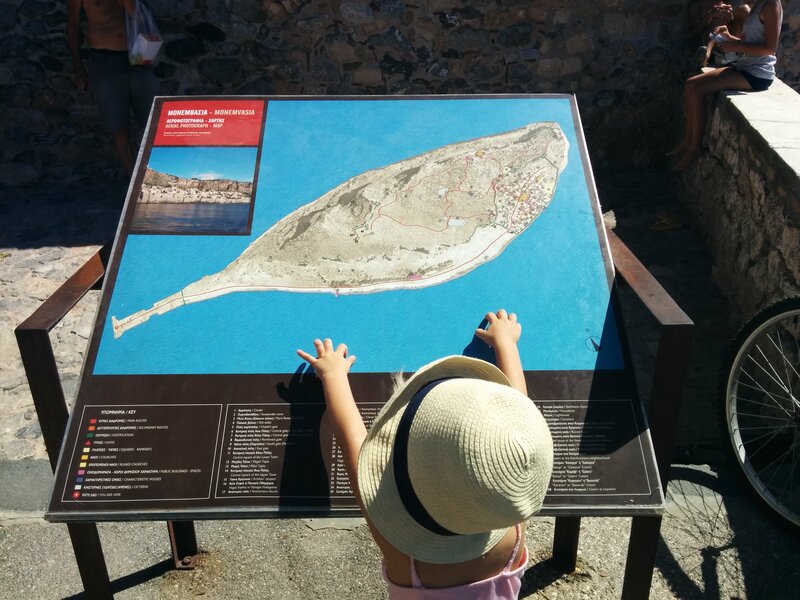 It was here that we decided that we would definitely come back to Monemvasia! Monemvasia isn’t very big. We needed 2 mornings and 2 afternoons to see most of the highlights. We visited the museum and the most prominent churches, we walked around the Upper- and Lower Town. We played at the main square with its canon, shopped at the few pretty souvenir shops and had drinks and dinner in several places. Unfortunately, the walls and fortress above the upper town were closed for renovation this summer. We would have needed another day to visit that part. 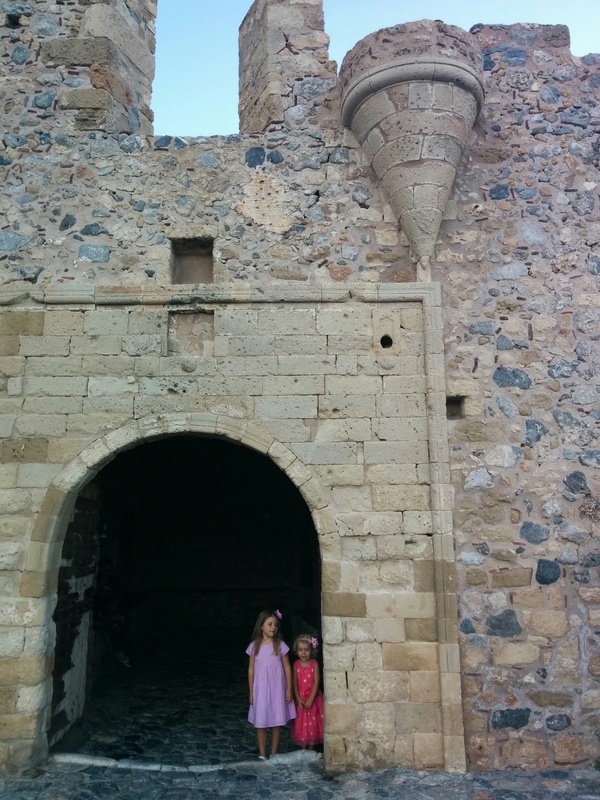 We especially loved the small Archeological museum in Monemvasia with kids. The entrance fee was 1 Euro for the children and for the adults and it showed just enough objects to keep my children interested and to make them travel in time and to understand how people used to live, eat and drink. 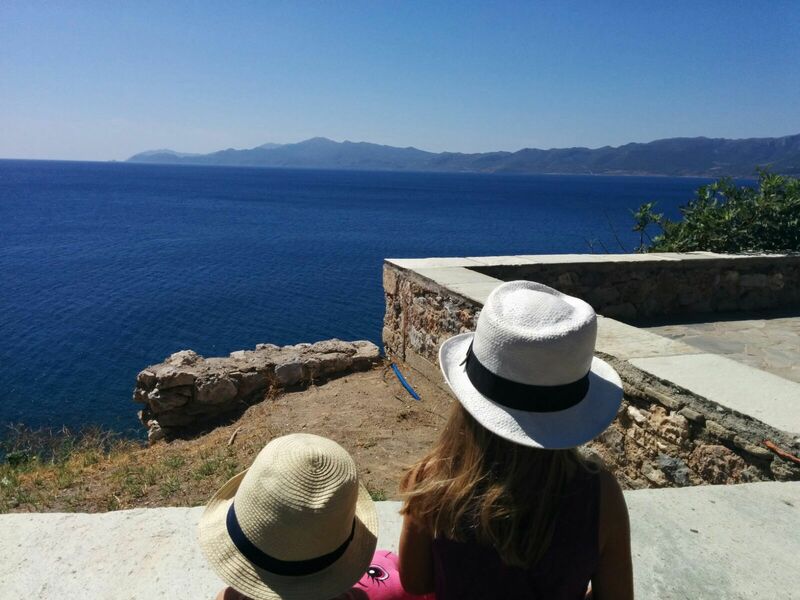 All children are fascinated by medieval castles, mysterious alleys, and exploration, Monemvasia is definitely the place for that. It’s education value doesn’t need further explanation. The Castro is car-free which makes it an enormous open playground. Due to its single entrance and village size, it is also a very safe place. 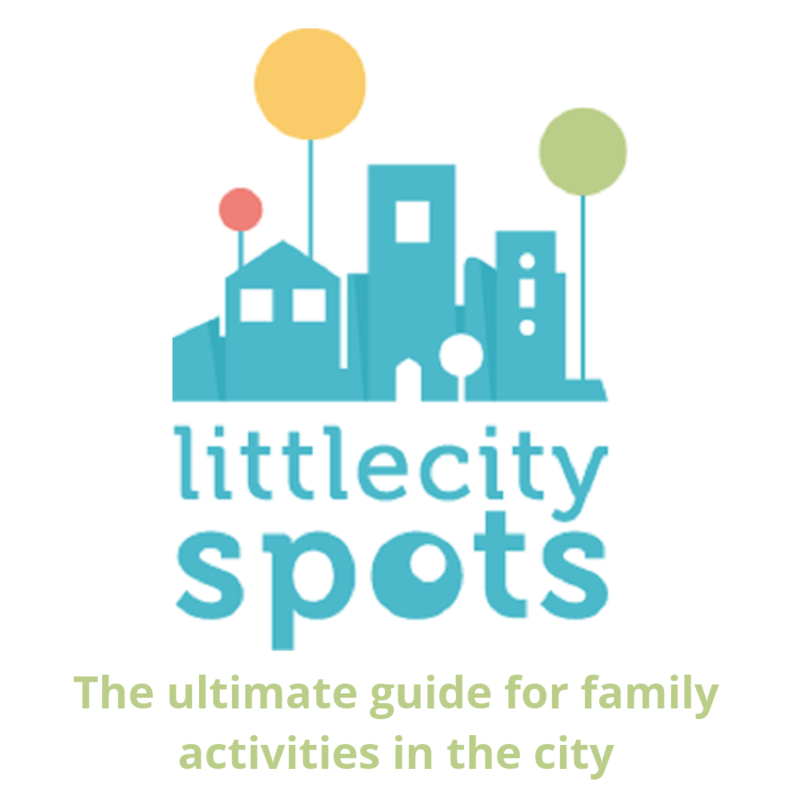 The main square is a perfect area to let your children run around whilst you are having a coffee or dinner. On the other hand, there are lot’s of high walls, windy stairways, cliffs and dangerous steps so the over-enthusiastic toddler has to be watched. It is impossible to use a stroller inside the Castro. But you can carry your baby in a sling or carrier. For children that just learned to walk it may be difficult to climb some of the steps but you can help them there. My youngest just turned 3 and with some sturdy sandals, she managed to walk by herself without much problem.